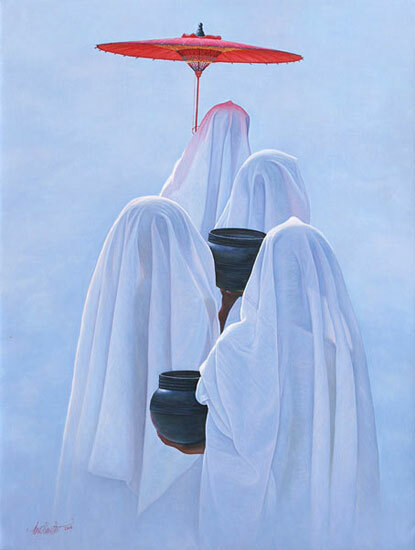 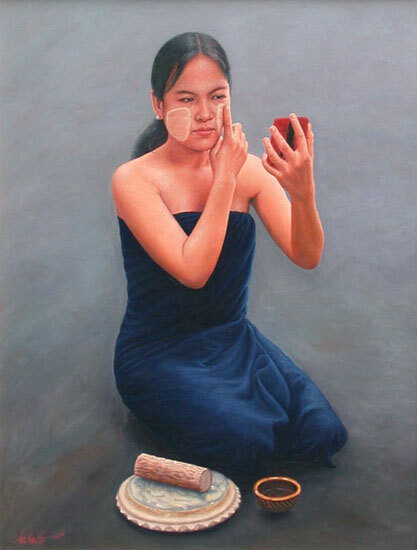 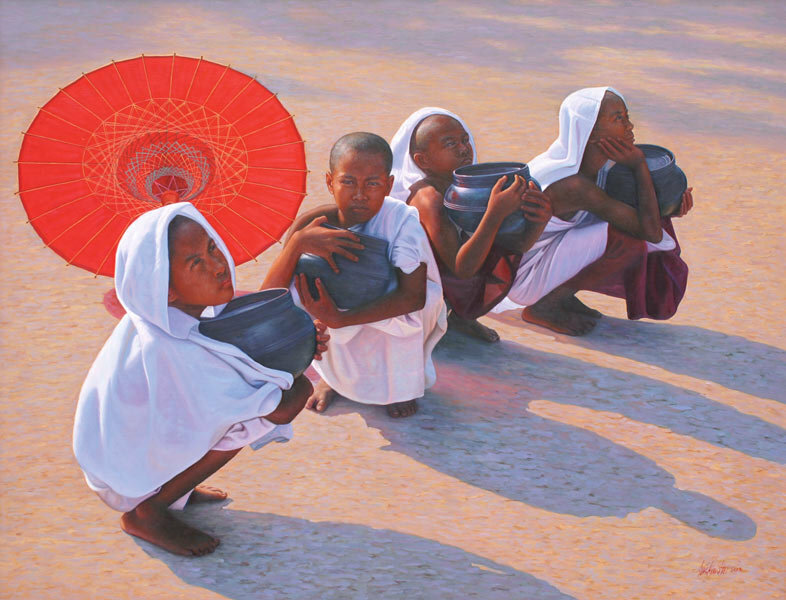 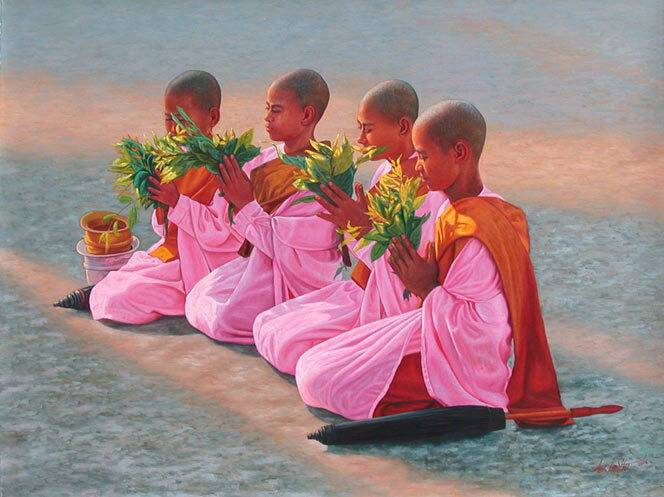 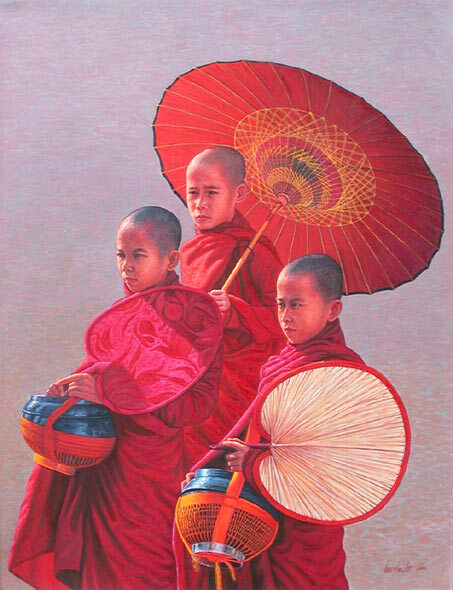 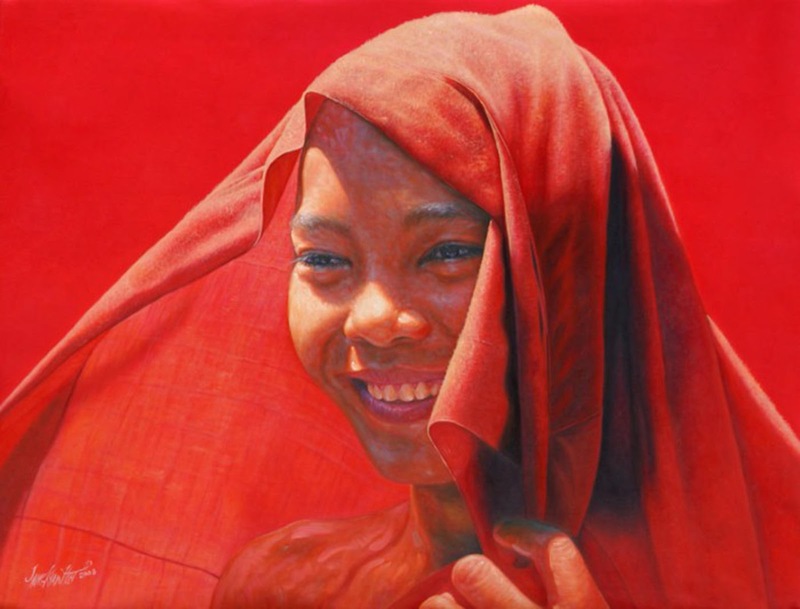 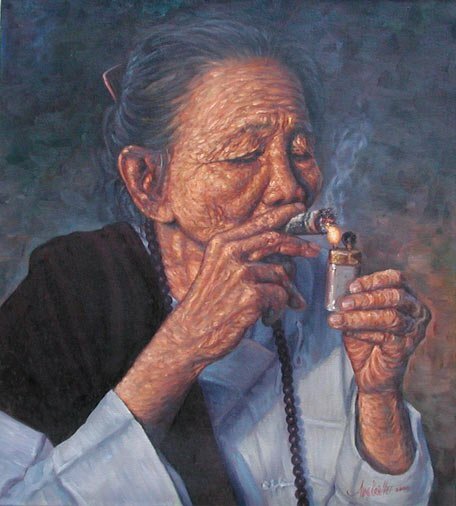 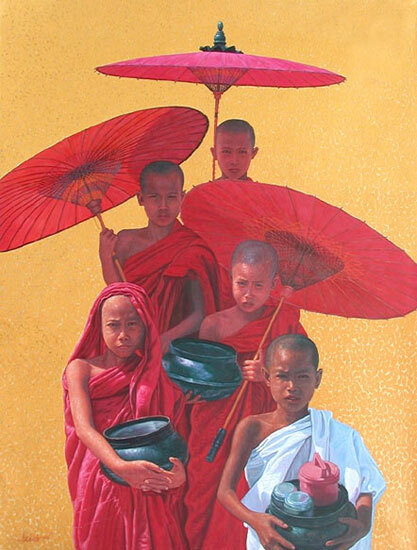 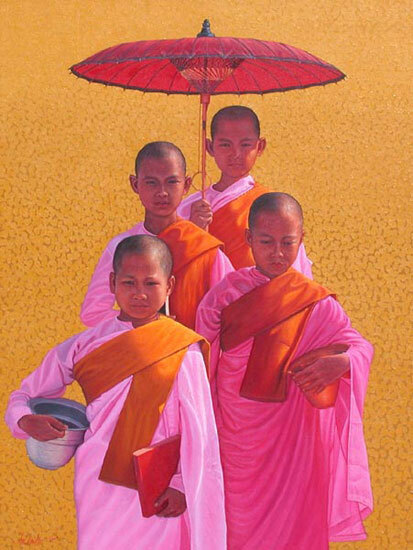 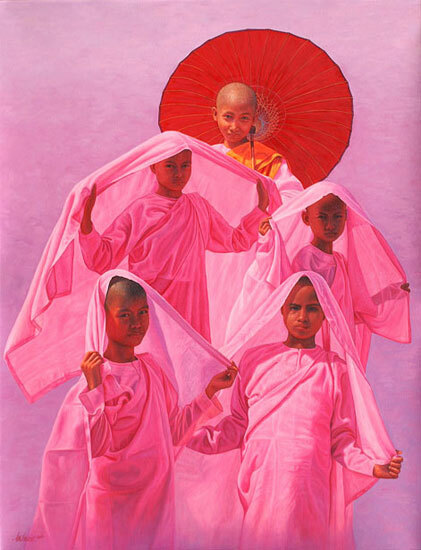 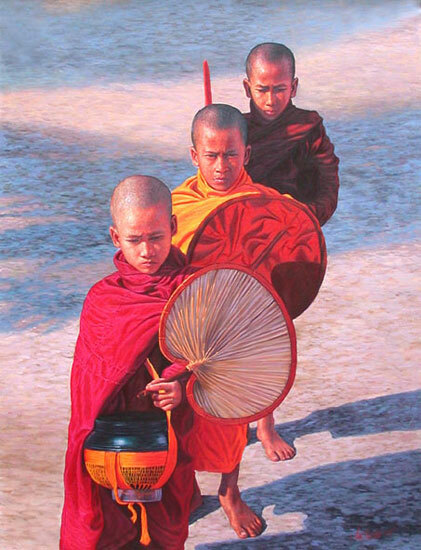 Aung Kyaw Htet paints the faces of monks and nuns in great detail to show their humanity. 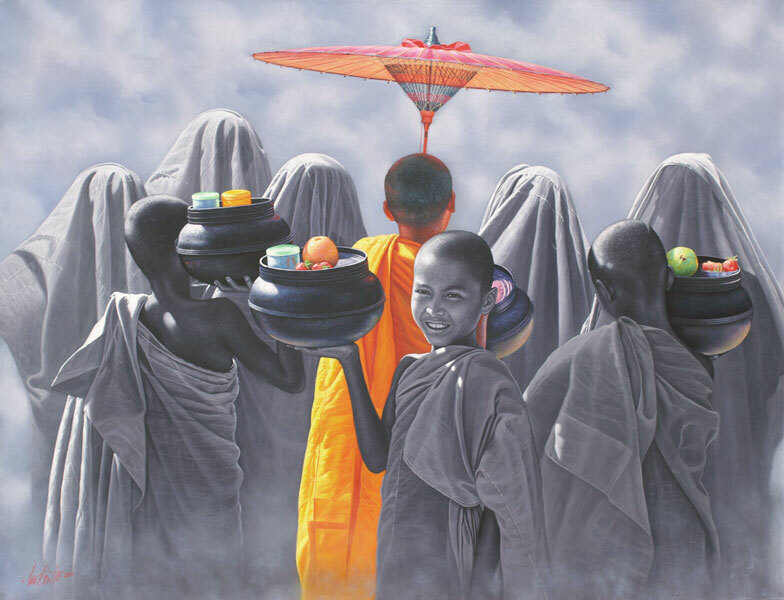 This is in contradiction to most Burmese artists who usually omit facial details to focus on monks as symbols of religion rather than as human individuals. 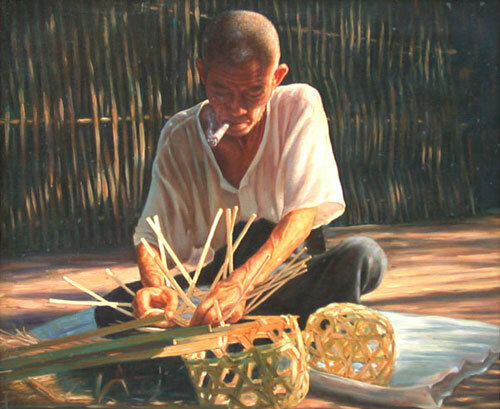 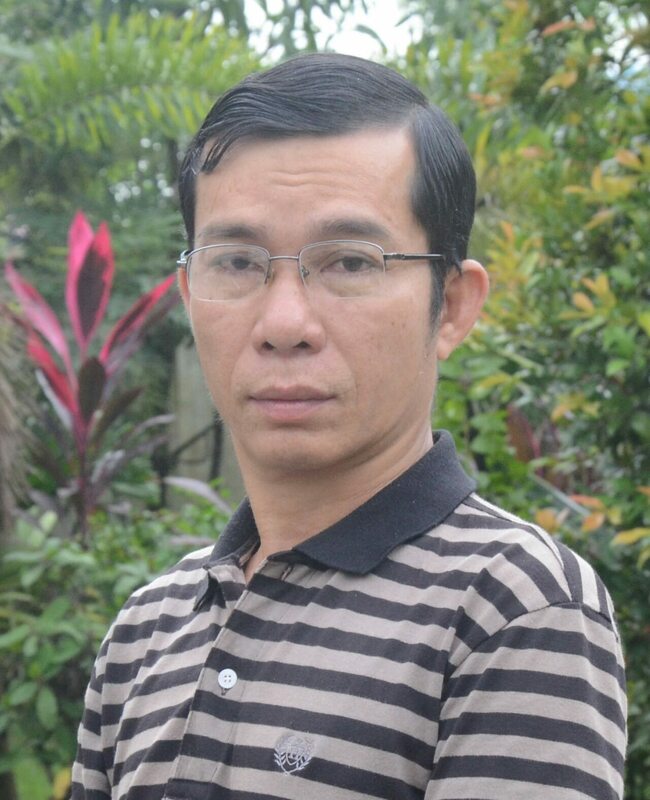 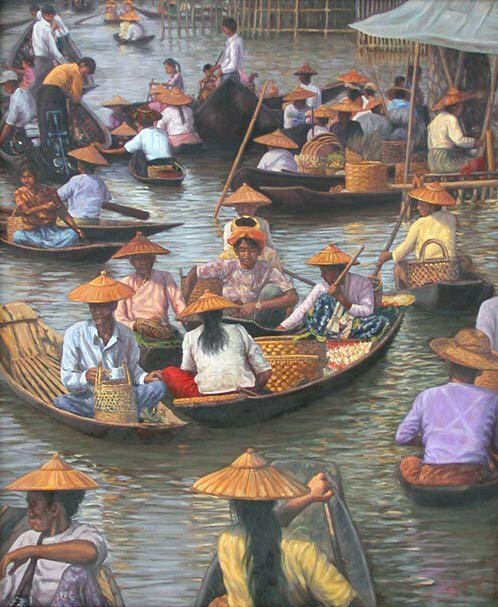 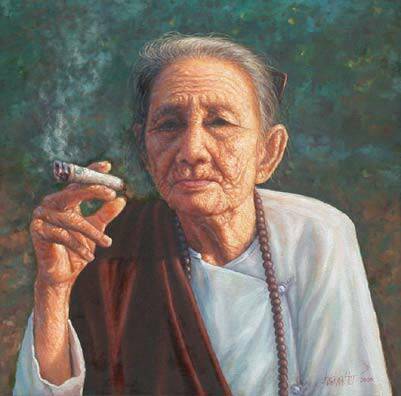 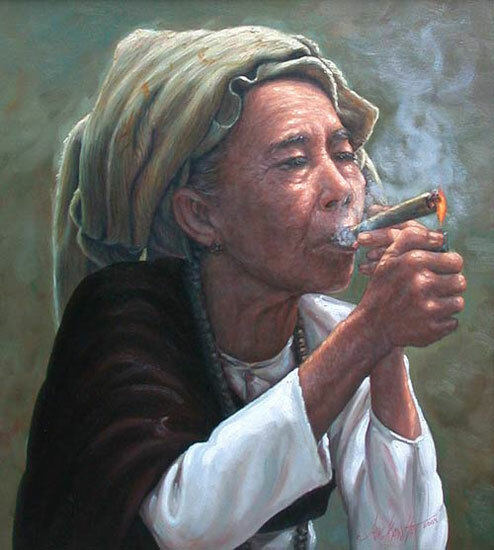 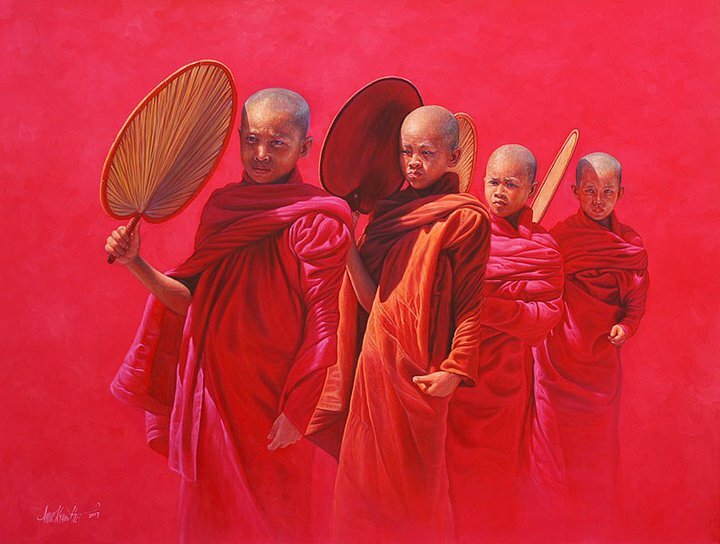 Aung Kyaw Htet was born in Myaungmya and studied at the State School of Fine Arts in Rangoon. 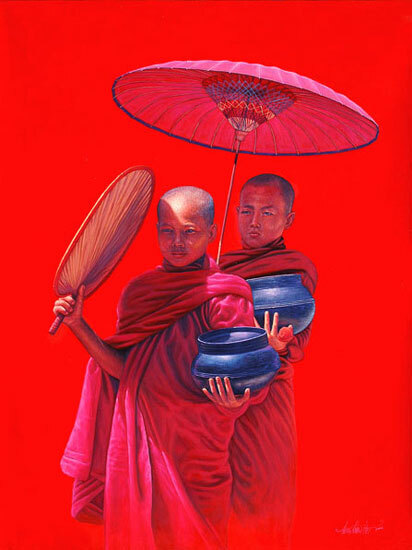 He is a devout Buddhist and grew up in a small village, two factors which have a strong influence on his art. 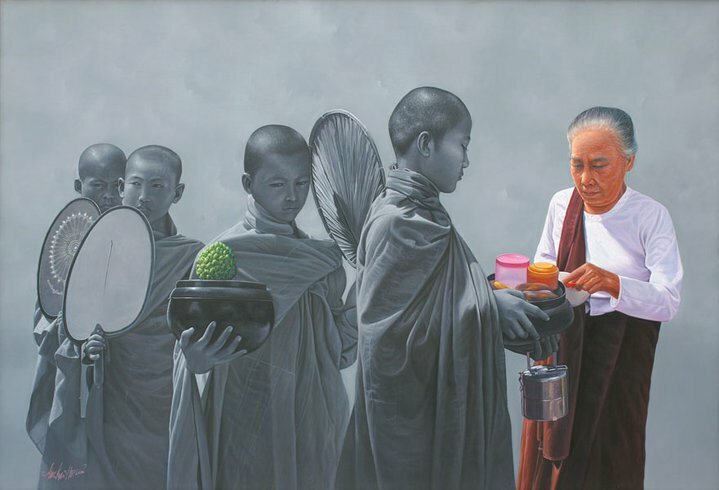 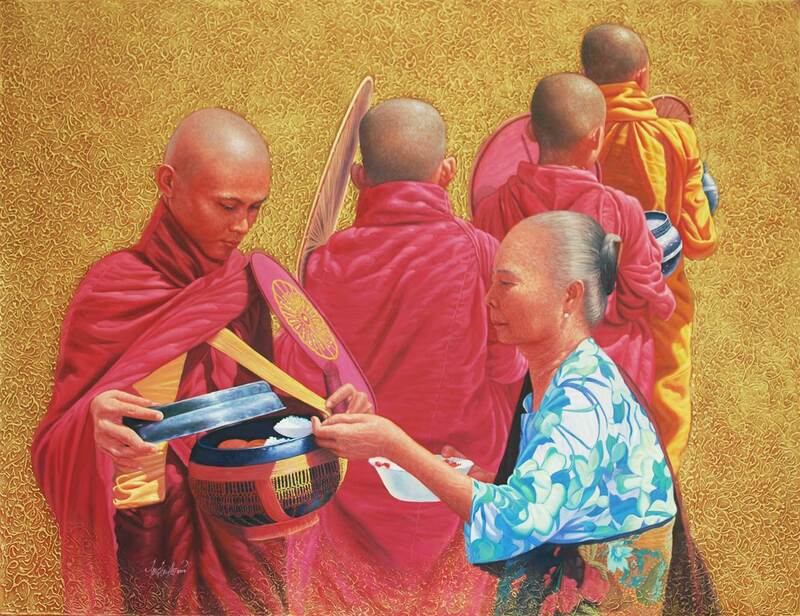 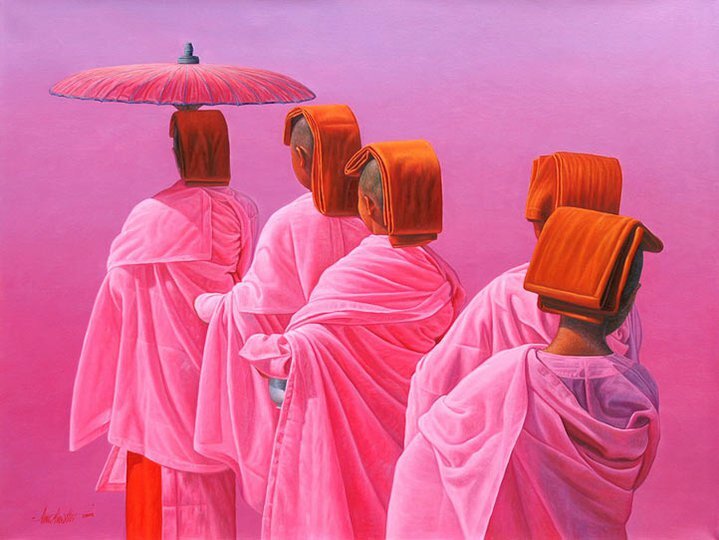 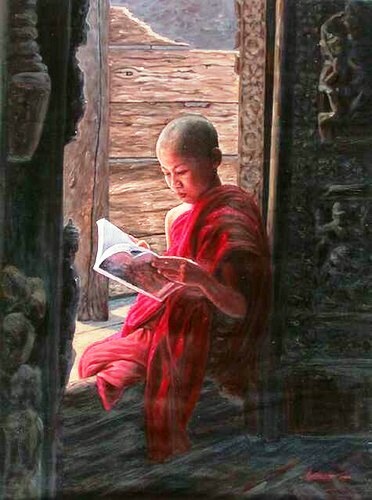 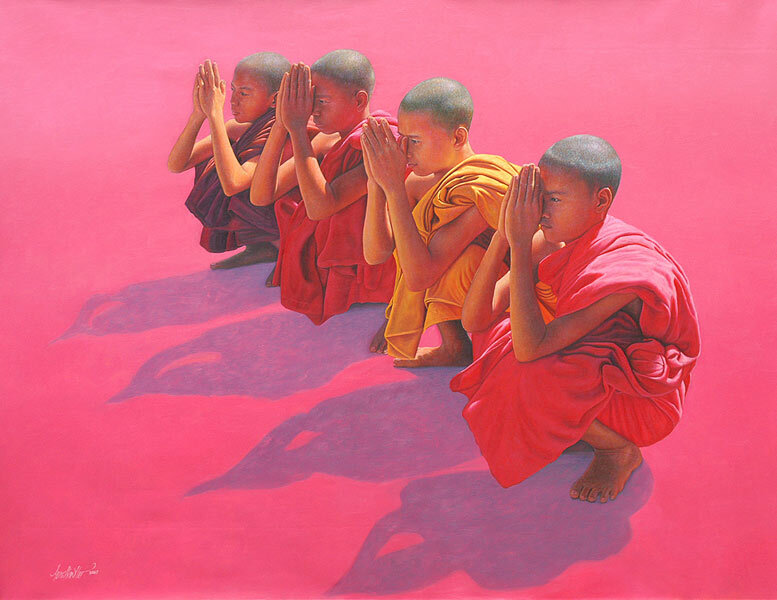 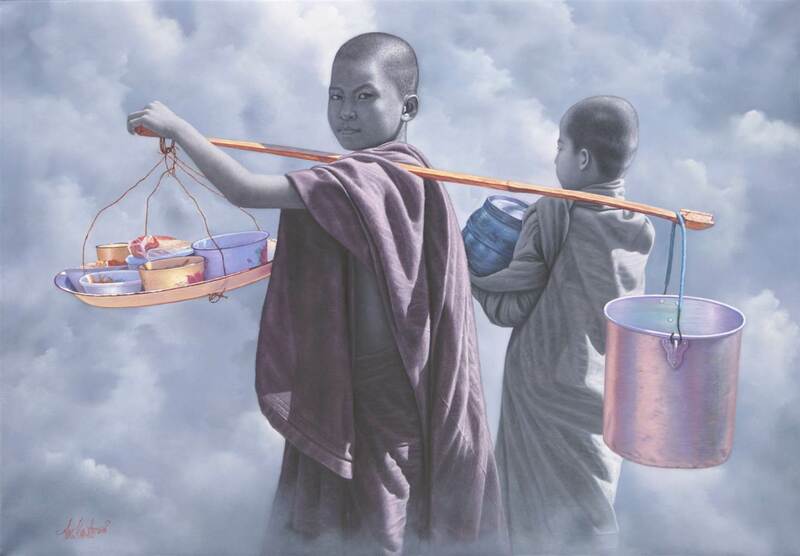 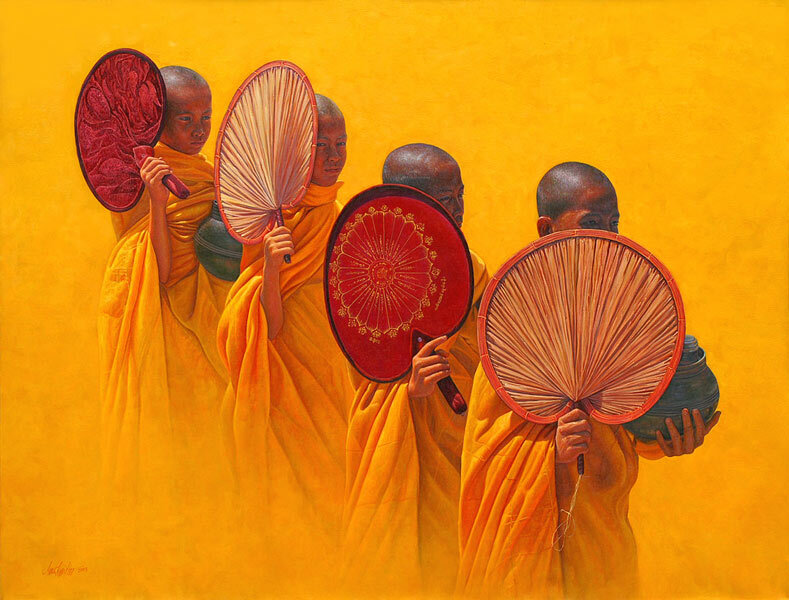 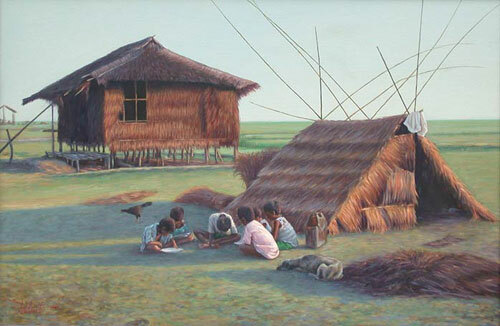 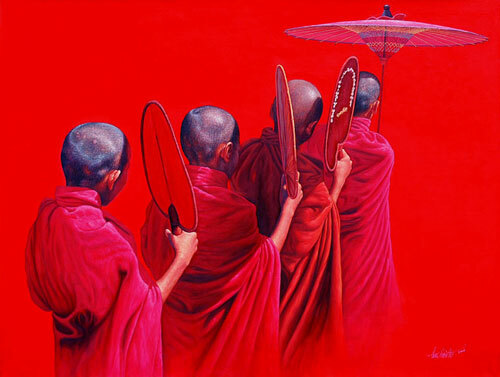 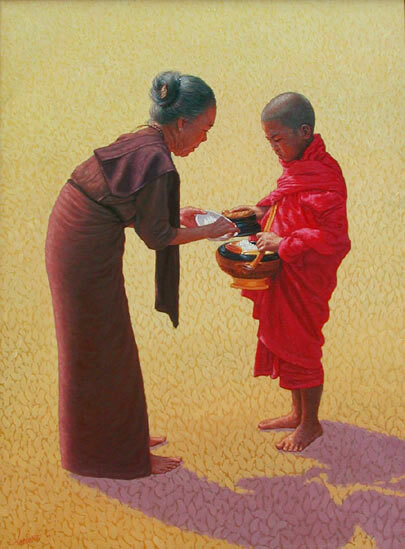 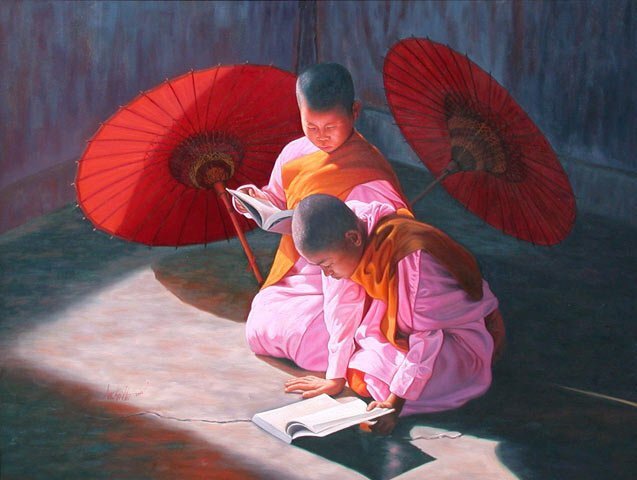 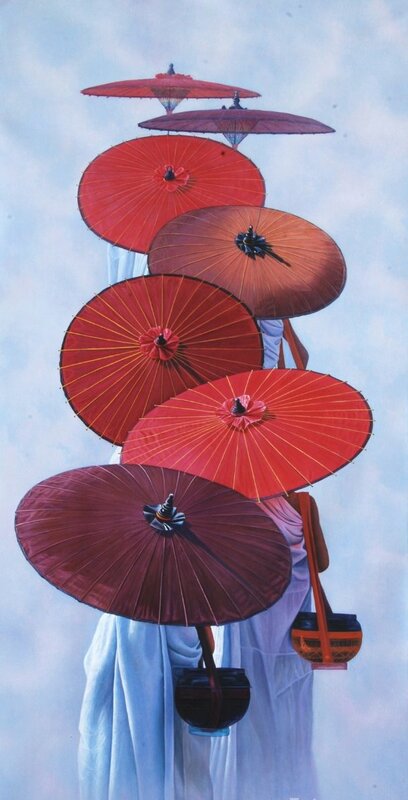 His paintings of religious life in Burma show monks and nuns in a realistic manner, though non-essential objects are omitted from the paintings in order to draw attention to the individuals. 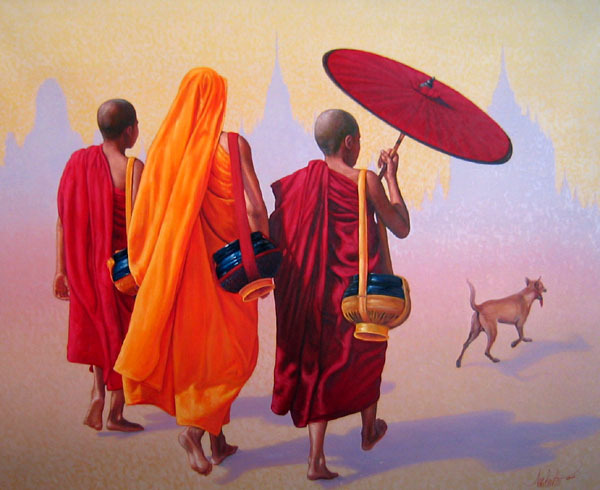 As Aung Kyaw Htet explains, “I learned that Buddhism gives you peace of mind and reinvigorates the body. 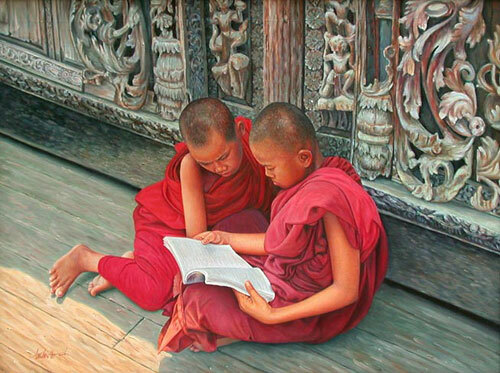 I want to educate other people about the teachings of Lord Buddha”. 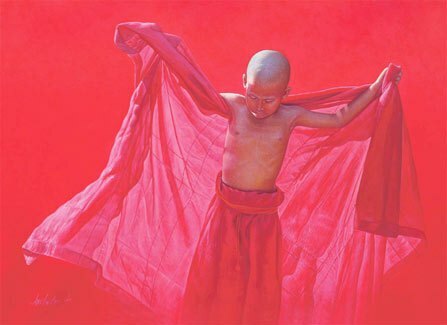 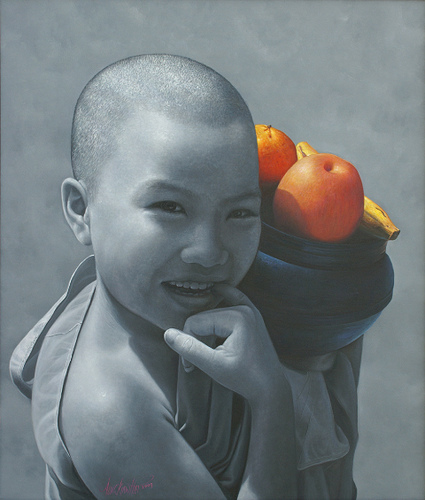 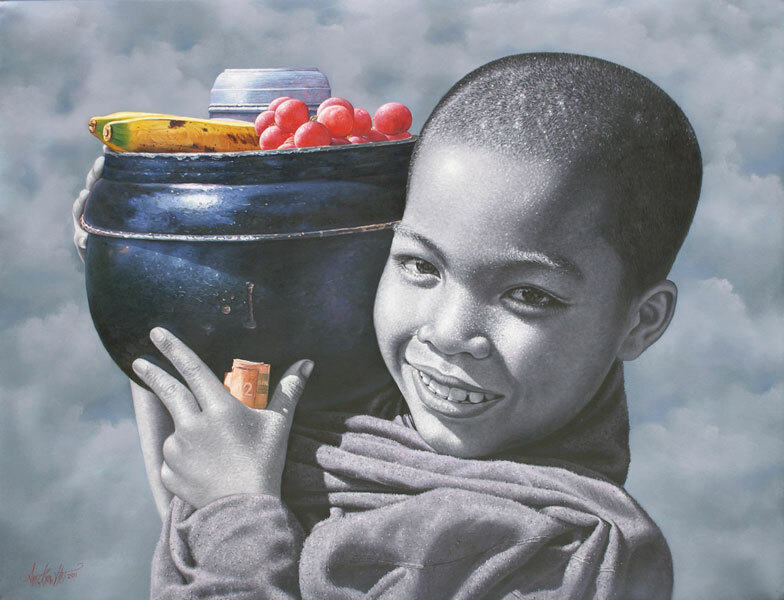 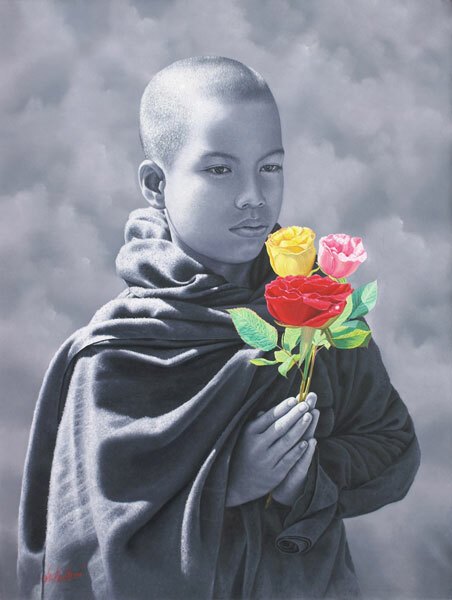 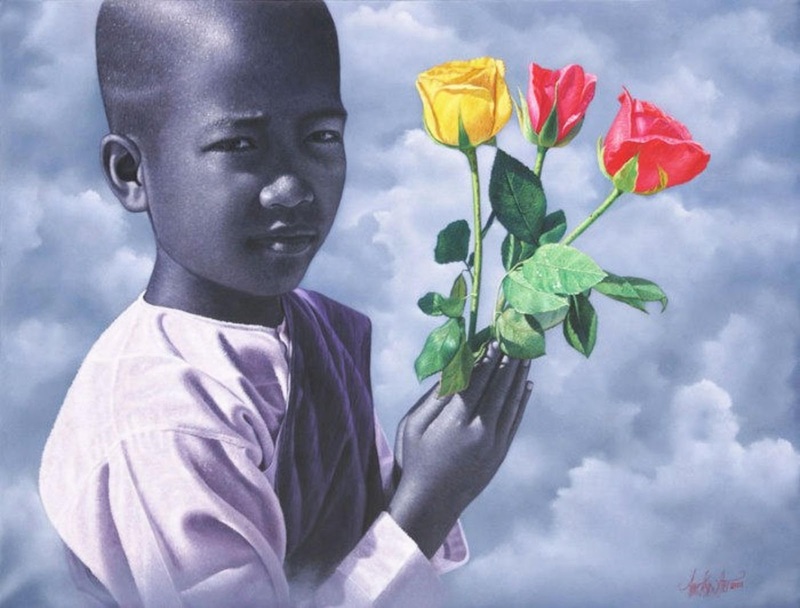 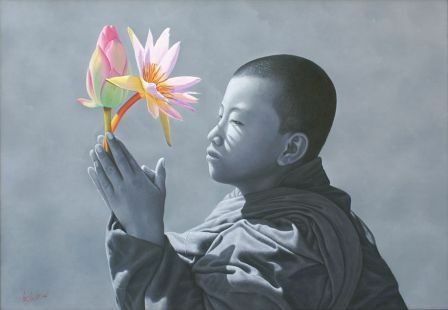 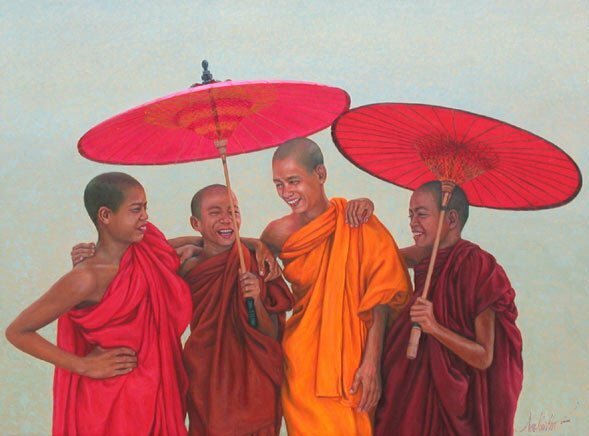 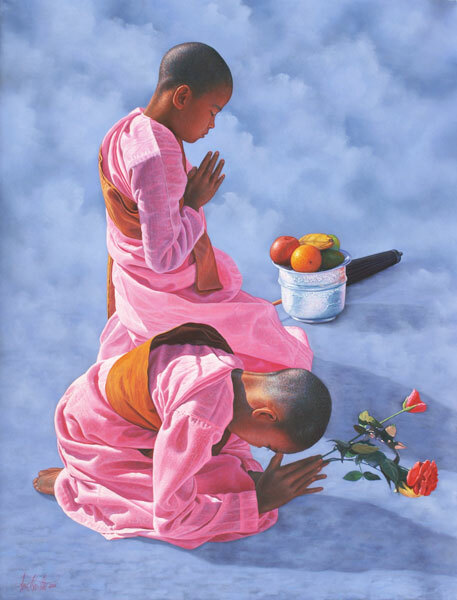 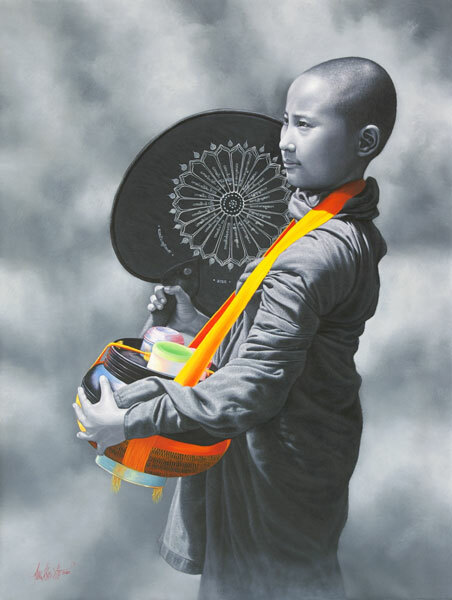 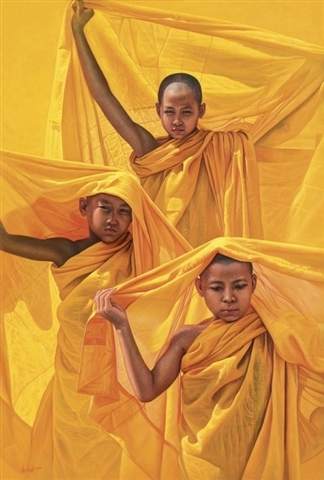 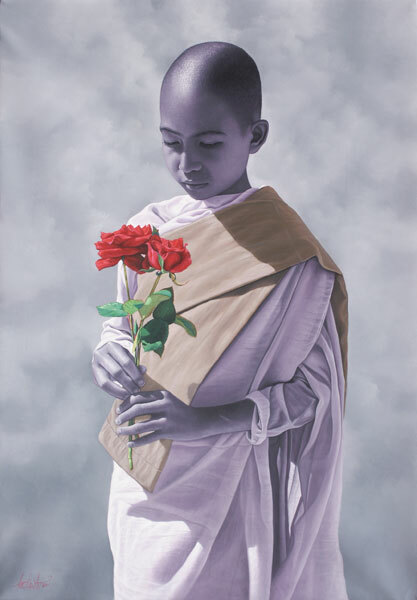 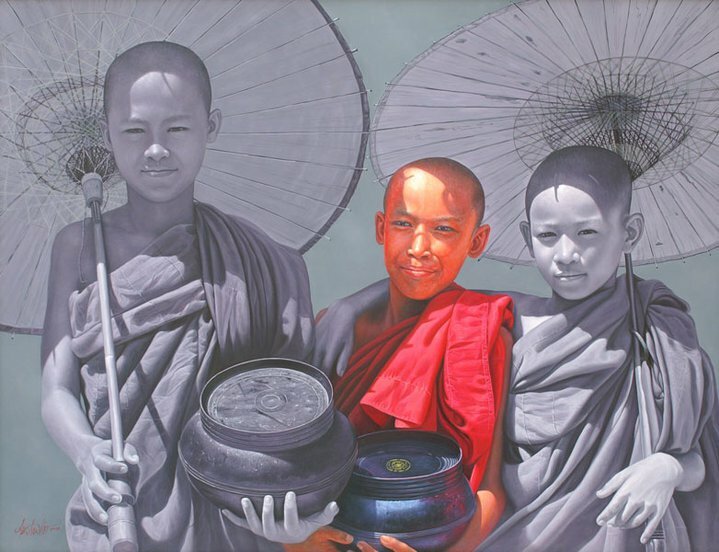 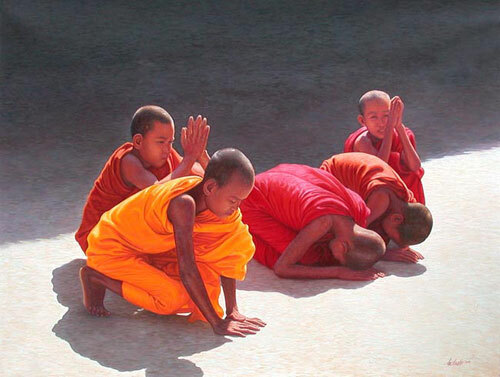 He often paints the emotions and aspirations of young monks and nuns thus depicting their humanity rather than as religious (Buddhist) symbols. 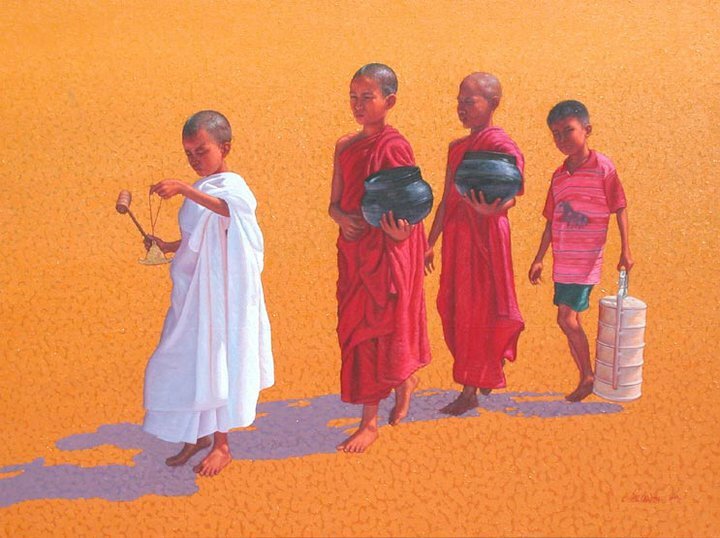 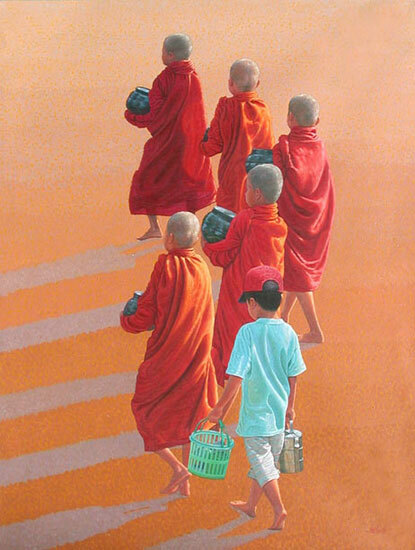 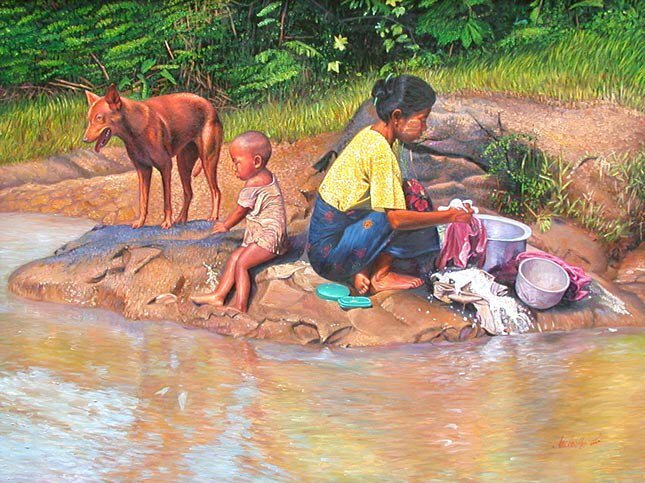 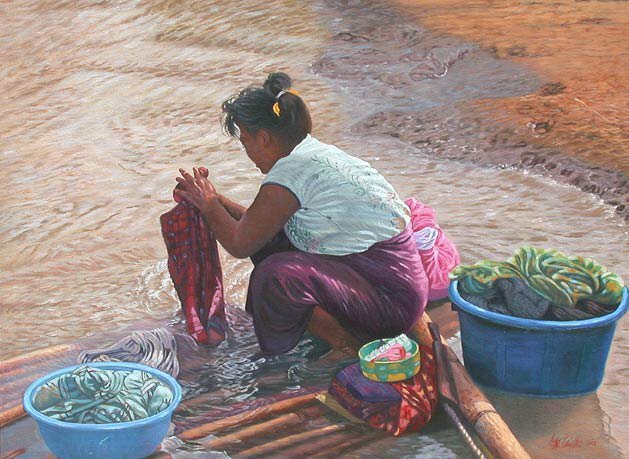 Aung Kyaw Htet's use of bright colours is attractive and draws the viewer's attention to the serenity in the paintings. 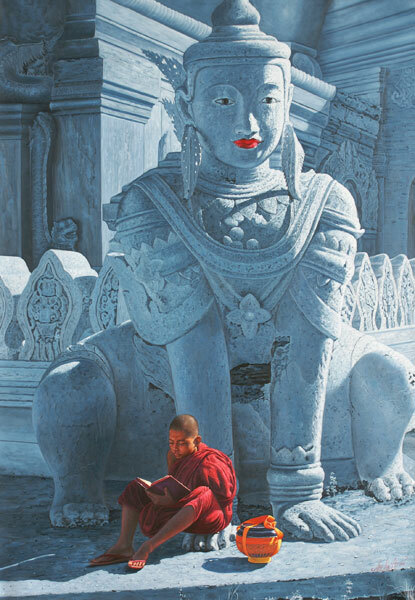 He has participated in several exhibitions in Burma, Thailand -2002, 2004, 2005, 2008, Singapore -2003, 2008, Hong Kong -2003, 2004, Taiwan 2006, and his works are in the permanent collections of the National Art Gallery of Malaysia and the National Museum of Myanmar, Burma. 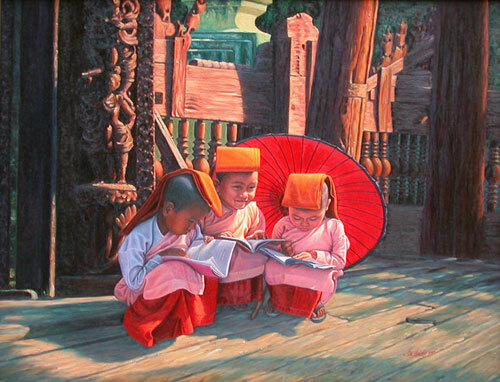 Aung Kyaw Htet currently lives and works in Yangon (Rangoon), Myanmar (Burma). 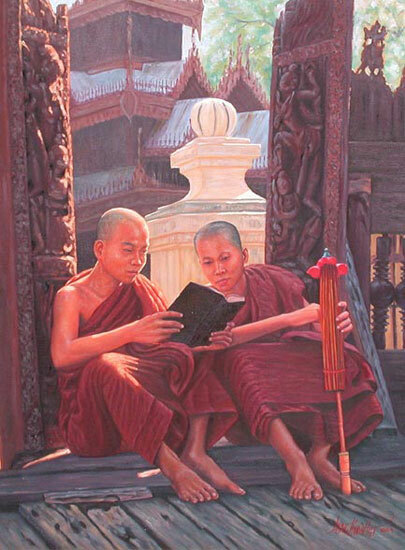 His paintings can be found in the collections of the National Museum of Myanmar and the National Gallery of Malaysia, and his work is featured in the monograph book, 'Aung Kyaw Htet: Myanmar Inspirations' written by Shireen Naiziree.